Location of Hurtsboro in Russell County, Alabama. Hurtsboro is a town in Russell County, Alabama, United States. At the 2010 census the population was 553, down from 592 in 2000. It was founded in 1857 as Hurtsville and named for Joel Hurt, Sr. (whose son, Joel Hurt, was an important developer of Atlanta, Georgia). A railroad spur from Columbus, Georgia was completed the next year. It was incorporated in 1872 and in 1883 the town name was changed to Hurtsboro. 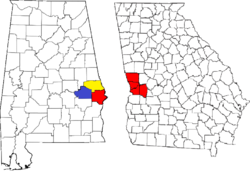 The town is part of the Columbus, Georgia-Alabama Metropolitan Statistical Area. Hurtsboro is located at 32°14′24″N 85°24′55″W﻿ / ﻿32.24000°N 85.41528°W﻿ / 32.24000; -85.41528 (32.240102, −85.415377). According to the U.S. Census Bureau, the town has a total area of 1.0 square mile (2.6 km2), all land. As of the census of 2000, there were 592 people, 283 households, and 161 families residing in the town. The population density was 573.7 people per square mile (221.9/km²). There were 342 housing units at an average density of 331.5 per square mile (128.2/km²). The racial makeup of the town was 70.27% Black or African American, 29.39% White, and 0.34% from two or more races. 0.17% of the population were Hispanic or Latino of any race. There were 283 households out of which 25.1% had children under the age of 18 living with them, 31.1% were married couples living together, 23.3% had a female householder with no husband present, and 43.1% were non-families. 41.7% of all households were made up of individuals and 18.7% had someone living alone who was 65 years of age or older. The average household size was 2.09 and the average family size was 2.86. In the town, the population was spread out with 24.2% under the age of 18, 7.1% from 18 to 24, 25.7% from 25 to 44, 22.8% from 45 to 64, and 20.3% who were 65 years of age or older. The median age was 40 years. For every 100 females, there were 93.5 males. For every 100 females age 18 and over, there were 82.5 males. The median income for a household in the town was $16,691, and the median income for a family was $25,000. Males had a median income of $26,979 versus $19,821 for females. The per capita income for the town was $16,908. About 28.4% of families and 32.8% of the population were below the poverty line, including 46.3% of those under age 18 and 28.5% of those age 65 or over. The Joel Hurt House was built in 1857. The home was added to the National Register of Historic Places on August 11, 2005. The City Grill Café is a local landmark. Some of the older buildings on Main Street.